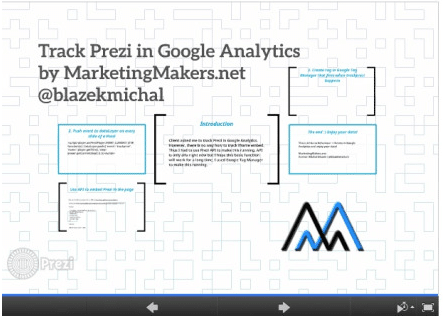 Client asked me to track Prezi in Google Analytics. However, there is no way how to track iframe embed. Thus I had to use Prezi API to make this running. API is only alfa right now but I hope this basic function will work for a long time. I used Google Tag Manager to make this running. Update 2018: After Prezi API update, this solution does not work properly. Feel free to fix it and send us updates. We will give you credits.